One definition of the verb focus is to pay particular attention to something. In speaking or writing, focus words direct attention to a particular part of a sentence. Think of using a magnifying glass to focus light on a single spot. 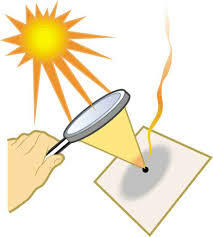 The sunlight is the reader or listener’s attention, and you want to focus it on that spot on the paper, which — like your writing, if you do it well — may catch fire. Put focus words as close as possible to what they modify. All too often, writers don’t. In English, word order and proper placement matter. Like danglers, misplaced focus words weaken a sentence and can confuse the reader. Such problems are usually easy to fix simply by paying attention to placement. Indeed, though Mr. Cohen was only brought to testify because Democrats had taken control of the House, some of the most striking exchanges were with the Republicans. Indeed, though Mr. Cohen was only brought to testify only because Democrats had taken control of the House . . .
Moving only focuses the reader on the reason Cohen was brought to testify, which is important, since he probably wouldn’t have been if the Republicans had kept control in the midterm elections. It says I will only spend 270 days and one hour more in the presence of my mother. The writer meant I will only spend only 270 days . . .
Why don’t you only plant white roses? Why don’t you only plant only white roses? The payment is only settled after the interview, which can happen a year after the couple gets married. The payment is only settled only after the interview . . . The manager told her he could only hire her if she had a Social Security number and a green card. The manager told her he could only hire her only if she had a Social Security number and a green card. At this point, it seems home prices have reached their limit and could only go up as fast as income growth goes up. At this point, it seems home prices have reached their limit and could only go up only as fast as income growth goes up. My community is Latinas in green-card marriages – those contracted solely to achieve permanent resident status. Some freelance writers are only bylined with no bio or photo. At first glance, my kneejerk reaction was to move the only, but luckily I looked again. Angelo meant the articles carried bylines, but no other information about the writers. More complicated is the construction not only . . . but also. Not only pretty much always needs to be followed by but also, not just but or a semicolon, and it needs to follow that same simple rule above. She not only writes about technology but also uses it to produce more engaging stories. He named it not only after “The Canticle of the Sun,” St. Francis’ literary manifesto, but resounded the same values. He not only named it not only after “The Canticle of the Sun,” St. Francis’ literary manifesto, but also resounded the same values. When not only . . . but also is used to show the relationship between two clauses, the first needs to be in inverted word order, like a question. Not only we need more Latinos in the newsrooms, but we also need Latinas. Not only do we need more Latinos in the newsrooms, but we also need Latinas. Not only journalists must be well versed in online platforms but also know about offline places that different communities use. Not only must journalists must be well versed in online platforms, but they must also know about offline places that different communities use. Not only Journalists must not only be well versed in online platforms but also know about offline places that different communities use. I was able to not only notice T.’s body language changes but also find out about Z.’s family history. The famed Italian fashion house has been a synonym not only of assertive style, but also of surviving loss and family togetherness. I now have language and methods that not only describe but also validate the way I felt back then. They represent about 15 percent of a total of 509 political prisoners, including not only politicians, but also protesters, students and even doctors who complained of lack of medicine and failing health system. Only is far from the only focus word that sometimes ends up in the wrong place. We’ll be working with colleagues whose work is mainly focused on this broad and very challenging region. We’ll be working with colleagues whose work is mainly focused mainly on this broad and very challenging region. The organization tries to help immigrants either identify either alternative opportunities or jobs . . . I am neither afraid of stepping out of my comfort zone or to hold discussions surrounding difficult or uncomfortable issues. I am neither afraid of neither stepping out of my comfort zone or to hold nor holding discussions surrounding difficult or uncomfortable issues. She has WaPoBot on her phone, a chatbot application developed by The Washington Post that I just made up. On her phone she has WaPoBot on her phone, a chatbot application developed by The Washington Post that I just made up. In addition, I worked for Electionland in 2018, a ProPublica initiative that gathers newsrooms all over the country to cover voting issues on Election Day. In addition, in 2018 I worked for Electionland in 2018, a ProPublica initiative . . . .
For this assignment, I took a step back and collected official data on immigration from Latino countries — legal and illegal. For this assignment, I took a step back and collected official data on immigration — legal and illegal — from Latino countries. Finally, when using appositives, remember that commas often travel in pairs. Unless the appositive is at the beginning or the end of a sentence, it needs to be set off with two commas. Rebecca Tancredi, vice president of programs at UpWardly Global, a national nonprofit that helps highly educated newcomers integrate into the U.S. workforce warned against the perils of the gig economy for skilled immigrants. Rebecca Tancredi, vice president of programs at UpWardly Global, a national nonprofit that helps highly educated newcomers integrate into the U.S. workforce, warned . . .